As summer slides into fall there is only so much more time to enjoy one of the great joys of the late summer in San Diego, Gazpacho. Often described as a “garden salad in a bowl,” this Andalucían classic soup is based on brilliantly fresh tomatoes and other equally fresh ingredients with finely chopped versions of those same ingredients often offered as garnishes. The traditional Andalucían version generally includes stale bread, tomato, cucumber, bell pepper, onion and garlic, olive oil, wine vinegar, water and salt. The bread is soaked in water and thickens the soup effectively, so much so that water is often added to adjust the texture. I have made that version many times and enjoyed it greatly. But I could not help wonder about the culinary value of the bread. Its historical value I understand. 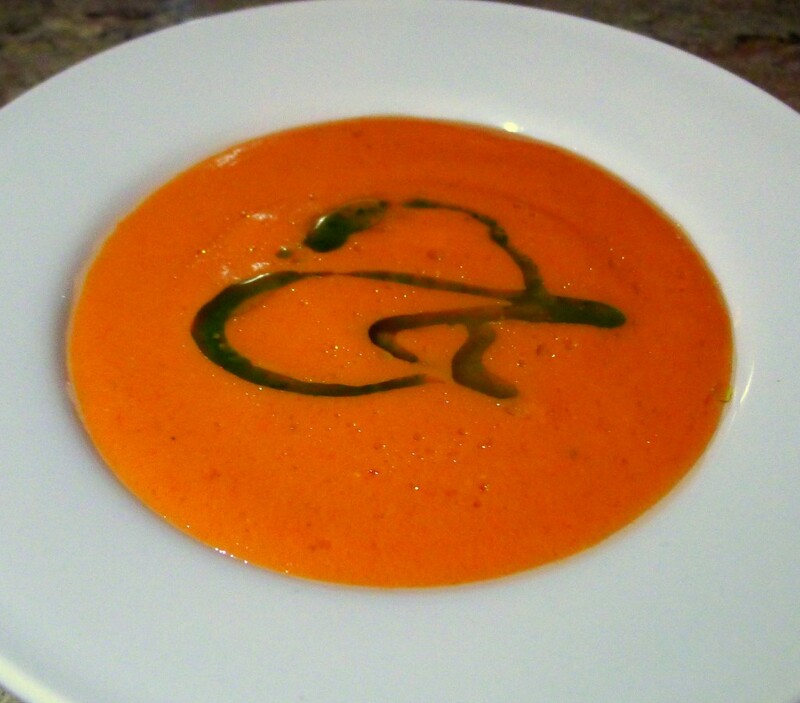 Gazpacho derives from the Moorish near millennia of history in Spain and the soup of bread, olive oil, water and garlic that came with them across the straits of Gibraltar. But, the conceits of this blog notwithstanding, the test of a dish is its flavor not its history. And for me, the bread and water dull the flavor of a dish that is all about how the freshest of ingredients crash against each other melding into a crystalline clear and different flavor that is entirely its own thing. There is no need for bread, no need for water. Whatever the dish may have once been about it is not about that for me now. It is all about the freshest possible ingredients at their height; nothing less, nothing more. 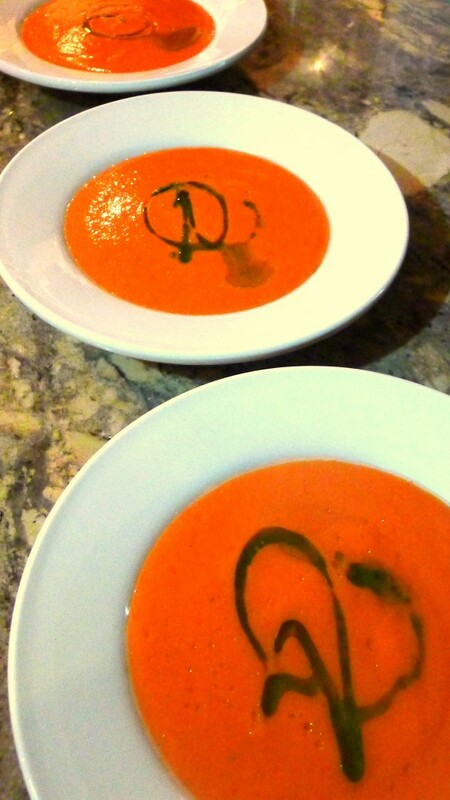 I am not saying it is impossible to enjoy a gazpacho made from average supermarket ingredients. But that will not show you the great glory of a gazpacho. For that you need better ingredients; the best in fact. Especially toward the end of summer I like to add a habanero pepper to the mix. Maybe it is just another hint, if not hit, of summer heat. As the hints of fall begin to creep in around the edges it adds a wonderful dimension to the last of the fresh tomatoes and peppers in the farmer’s market and in our front yard. 1. Purée the Cucumber. Coarsely chop the cucumber and add to a Vitamix or other high speed blender (or a food processer). Starting on the lowest setting possible, begin pureeing the cucumber, gradually raising the setting until the cucumber is completely liquidized. 2. Purée the Bell Pepper. Return the Vitamix to its lowest setting. Coarsely chop the bell pepper and repeat the previous step with the pepper. 3. Add the Tomato. 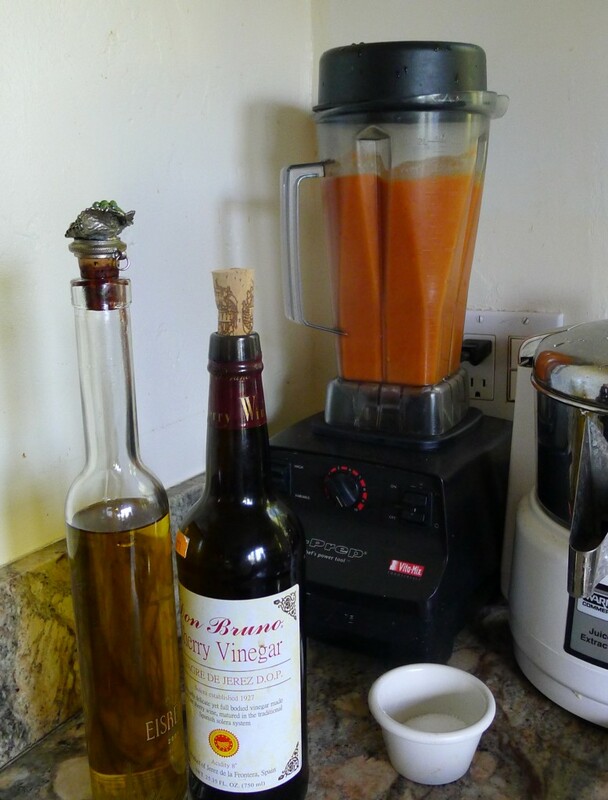 Quarter the tomatoes and add the quarters to the Vitamix one at a time. 4. Build the Soup. Add the sherry vinegar and olive oil to the soup. Add ½ of the habanero pepper to the soup and process at the highest speed. Taste the soup and adjust the salt, pepper and vinegar balance. Also test for heat. If you want more, add the remaining ½ habanero pepper. 4. Finish the Soup. Refrigerate the soup for at least one hour either by transferring the soup to a storage vessel or, frankly, in the Vitamix with its top on. 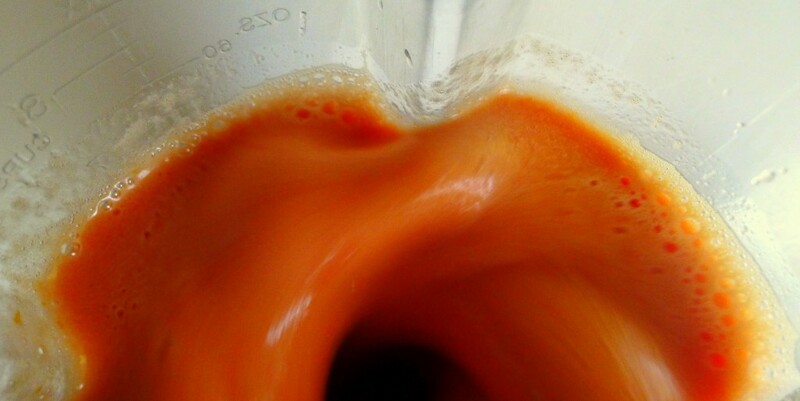 Strain the soup through a fine mesh strainer or tamis. Garnish, if you wish, with the herb oil. I wished.